Date: 14.03.2018 | Dance, Disco, RnB, Pop, Blues, Rock, Jazz | Tags: 70s, Back to School, Crimson Productions, Demon Music Group, Village People, Odyssey, Gene Chandler, Chairman Of The Board, Edison Lighthouse | Download 70s Back To School (2018) for free. 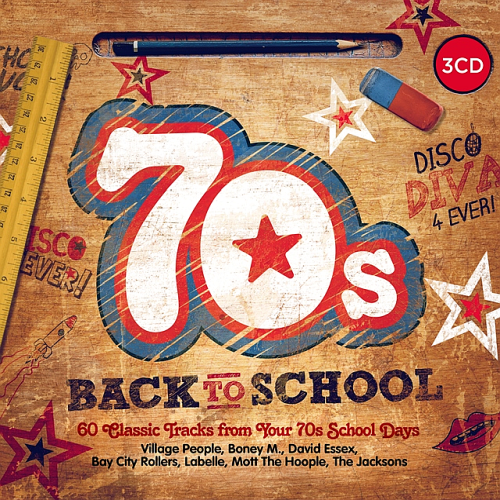 70s Back to School includes 3CDs covering 60 of the Best Hits from your 70s School Days. Featuring: Village People, Mott The Hoople, The Jacksons, The Emotions, Lulu, Ian Dury, Lou Reed, Wild Cherry, Hall & Oates and many more. Record label operated by Crimson Productions, a subsidiary of the Demon Music Group Ltd., releasing budget compilations. Demon Music Group is the UK’s largest independent record company, specialising in the marketing of physical and digital catalogue music with repertoire sourced from both major and independent companies around the world as well as our own vast library of rights. We are passionate about what we do and take pride and care in all our products ensuring our position as the UK’s leading independent record company.